In last April, a film “Radio Days” were released. The film was comedy around the production of the first radio drama in Korea in the 1930s. There are other films that dealt with popular culture in the 1930s like “Modern Boy” and “Once upon a Time in Korea.” It has been a sort of “trend,” but the commercially so-s0. Anyway my focus is not the film itself but the soundtrack of the film, The music director of the film, Sung Kiwan is the leader of the respected indie band The 3rd Line Butterfly (some of here saw the band play in July 2005 after Inter-Asia cultural studies conference). 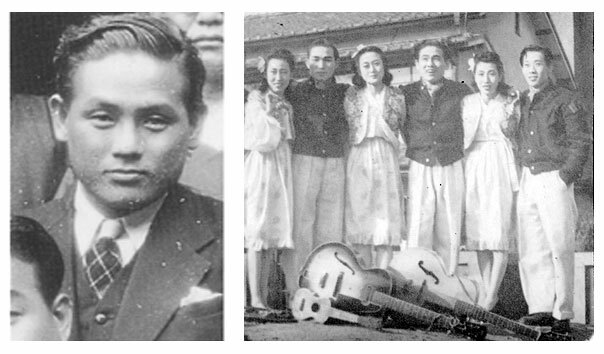 Recently he has been obsessed with Kim Hae-song: 金海松: 1913-1950) who was one of the important figures in Korean popular music and one of the pioneers of “jazz” and “musical” in the 1940s. Kim Hae-song (left) and his band members (right). In the latter, the third from the right is Kim and the first from the left is Lee Nan-young who was Kim’s wife and was “the voice of colonial Korea”). Unfortunately I could not found out the date and year when the photo was taken. 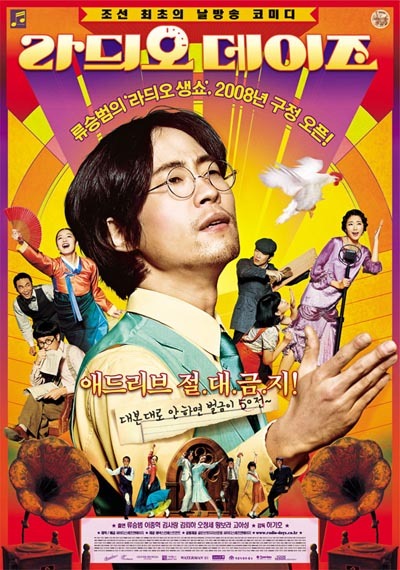 In the film, Kim’s songs were used frequently. And the song “Youth Class (Cheongchun Kye-geup)” was a sort of theme song of the film. The date of original recording is around 1938 or 1939 and the SP record was released by Columbia record (Korean branch of Japanese record company and on eof the biggest one at that time). Although Kim Hae-song concentrated on composing, arranging and conducting after 1940s, he recorded some songs in the 1930s. In my view, he can be compared to Japanese songwriter Hattori Ryoichi (服部良一) or Chinese songwriter Chen Gexin (陳歌辛). Sadly he died during Korean War (around 1951?) . In soundtrack album, there are two versions of “Youth class.” The one is original recording and the other is cover version JODK big band which was formed by the fil soundtrack by the members of different indie bands (trivia: JODK was a call-sign of Kyongsong (Seoul) Radio broadcasting company. JOAK was for Tokyo, JOBK was for Osaka and JOCK was for Nagoya. It is said that JOEK was reserved for Taipei). You can hear the song in the links below. The lyrics were written by Cho Myung-am (趙鳴岩) who used to have been “modernist poet” and so-called “converted left-wing intellectuals” after 1930s. I hope I can tell his second life in North Korea after War later. Now I will just translate the lyrics into English. It is hedonistic ad “decadent” with “exotic” words from French, Russian, German… It seems that Korean (male) intellectuals desired not only liberation but also consumption. Let’s sing songs, soneta of love. Oh, beautiful amoreu (amour). Oh, daririr-daririr-daradda. Oh, pretty girl. Oh, daririr-daririr-daradda. Let’s dance and sing. This is paresu (palace) here. We are Eroika, the brave of the shadow. Oh, tender devil. Oh, daririr-daririr-daradda. Let’s drink shampang (champagne) and let’s dance and sing!